Just in time for Halloween I found this fun new book. It starts off by asking what the different colors of Halloween are. When I first read this to one of my nephews, he started naming specific colors: orange, black, purple. But then when we got into the story he, along with the rest of the readers, realize that there are so many more colors that are associated with Halloween. There is the white of a ghost or the blue of a wizard. Pretty much any color can be associated with a cartoon (and non-frightening) creature which is associated with the monster of all holidays. Plus the cadance is just right for reading to youngsters. Each page starts out by saying, “Halloween is ____” and lists a color. Then there is the rest of the text which dares any reader to not read it in a rhythm that almost sends the readers through the book like a runaway Halloween train that everyone is happy to ride. 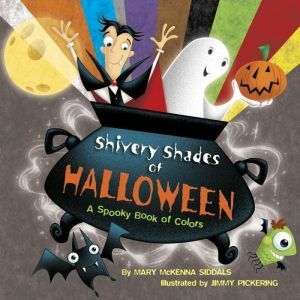 Seriously, this is a fun look at colors for any young fans of monsters, dressing up, or trick-or-treat fun. Dress up as a monster or in some other costume. See what colors you can find around the house. Talk about what colors are usually associated to different holidays, and then find other colors that would work too. Draw a picture where you make a different Halloween monster with each color you use. October 13, 2014 in book review, colors, Halloween, picture books. Many FANGkS again… and Happy Halloween!